We hope everyone has a very beautiful and delicious Thanksgiving. Also the gift of family, friends and lots love. Be thankful for what blessings you have in your life and never take them for granted. We won’t be on the internet tomorrow. We are driving up to Eastern Kentucky for our family get together. The boys didn’t really like the turkey I made out of bologna. I thought it looked half way decent, it had some good legs on it, hot dogs. Now who else could think of that? Nobody in the right mind anyway. But we are leaving this afternoon and we are spending the night up there. We will be back either late Friday evening or Saturday morning. You know if there is no postings on here for Saturday, we might have been snowed in or flooded out. Goddess, I hope not. I love them to pieces but I believe anyone can only take so much of their relatives, then it is time to run. I just wanted to let you know that we are headed for the hills and will be back Saturday. For those of you, like us, traveling this weekend, please be careful. Be sure to eat lots of turkey and dressing and don’t forget that all important nap after dinner. We are off for now…..
One more word, don’t forget about the Super Black Friday sale going on at Magickal Necessities. If you can’t find something for someone else, then buy you a thing or two. Remember to use the code “Black Friday” when you check out. Then all the items in your cart will all be reduced 25%. This is a once a year sale, so take advantage of it while it lasts. Full Moon 23 November 2018 – Temper Temper! The Sun coming up in this position means that you’re a beacon of hope for some important people right now. The challenge comes in when you feel burdened by having to carry others’ emotions. Taking on too much only drains you, and rarely makes anyone else feel better. This card is calling you to claim your bright, magical birthright. Setting stronger boundaries isn’t mean. It’s important for keeping you sane and happy. A little healthy separation is best now. You may feel like a rebel without a clue, ready to speak up against those who are in power who are wielding it inappropriately. But beware, as you buck authority during this time you might also be susceptible to bad advice that can turn your gentle eccentricity into abnormally unethical actions. If you must reject tradition, do so through creative outlets such as music, art, fashion, or the causes that you choose to support in your personal time. The word to beware of today is “obsession.” There is an addictive element in every relationship, but devotion explodes into fixation when it is uncontrolled. The action now is to slow things down if someone completely occupies a mind or minds. 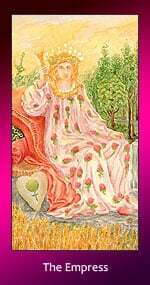 You are not in a soft and fruitful love if The Empress has struck a familiar cord. Positive devotion adds strength and delight, as long as it is healthy and mature. Keywords: harmony, abundance, generosity, humility! 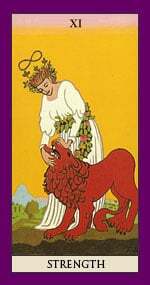 The Star, being one of the very positive cards of the Tarot, reminds us of hope and inspiration. The Star is the symbol for our faith in the future, for feeling guided on our path by its calm and serene light. We can feel confident to not lose our direction, and as we regain motivation and inner strength, we experience peace of mind. The Star protects the future and gathers the forces necessary to expand our knowledge and develop emotionally and spiritually. 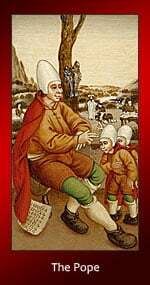 The sense of protection, promise, inspiration, and joy encourages us to develop our talents to achieve our ideals. Even in an unfavorable situation, the negative elements merely throw obstacles in our way like pessimism, a lack of realism, or the inability to accept a helping hand, thus leading to possible failure. ASTRO-TURKEY, THANKSGIVING ZODIAC, WHAT’S YOUR GAME PLAN THIS YEAR? There’s no time to waste for an Aries, they want to get the show on the road and get things organized. Before you know it, they are off to get the Turkey. Stand by, because everyone will have a job to do, it will be a delegated affair. November 22, 2018: Don’t be too serious, it’s a day of togetherness and to reconnect. If there’s a Taurus in the house, don’t even think about entering the kitchen without permission. They’re in control and you can expect nothing short of a gourmet delight, with stuffing and all the other goodies. November 22, 2018: Trust your instincts today, Taurus, and take a step back to watch the interaction between family. The twins like to be prepared, so don’t be surprised when they come home with two turkeys. You just never know when someone will drop by, so the more turkey you have on hand the better. After all, then you’ll have turkey for the whole week! November 22, 2018: And an unexpected friend could actually drop by this year. So, expected the unexpected. Does everyone have enough, there’s more turkey? Cancer sun sign people are great homemakers. They never forget anything, as well as making sure you have a second helping! If you are going to a Cancerian household you better not eat for a week, at least! November 22, 2018: Don’t apologize for spending extra time on how your home looks, it’s all part of the festivities. In the Leo household, everything is big and grand. You’ll have the biggest, latest and greatest award-winning turkey Mr. or Mrs. Leo can find, even if it is imported. There are lashings of gravy and everything else that adorns a Thanksgiving table. November 22, 2018: Allow yourself to feel sentimental today, even if it does make you feel vulnerable. Virgo is in charge of quality control. Never mind what it looks like, or the size, or where it came from, let’s get to the most important matter of a turkey – is it juicy and flavorsome? When Virgo is in charge, don’t mess with them. Stand back and let them take over. November 22, 2018: Leave the past in the past. The power and pleasure are in enjoying the moment. The turkey has to look beautiful for a Libran to find it appetizing and more-ish. Yes, it might be the best turkey ever and cooked to perfection, but if it’s not displayed as a piece of art on the table it can lose its appeal and quickly. Don’t forget to buy the garnish! November 22, 2018: If it makes you feel better to be a little extravagant on the trimmings if you can, then do it. A Scorpio may not have been involved in the buying or cooking of the turkey, but you can be sure that they will be on call to do the official taste test. There’s no doubt that a Scorpio knows best, so don’t cross them when a turkey is involved. November 22, 2018: You are a great organizer. Be prepared to step in to make sure the day goes to plan, but be careful not to step on anyone’s toes. When it comes to turkey for Thanksgiving Day, money is not an issue. Whatever it costs, a Capricorn will part with their hard-earned dollars. Capricorns are family oriented people and money is no object when it comes to a special day like this. 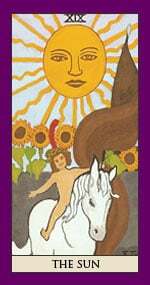 November 22, 2018: You want everything to be right, but today, it is best to let go of your perfectionist attitude to allow others to help out. Being a humanitarian, the Aquarian may be more concerned about how the turkey is treated, rather than the cooking process or how it tastes. If you’re in control of buying the turkey for an Aquarian, make sure you know the process of how it got to the market, before it gets to your table. November 22, 2018: Everyone has a point of view. You can’t please everyone, but you can agree to disagree. If anyone appreciates a good Thanksgiving dinner, it’s a Piscean. You can expect to hear positive hmm, hmm sounds that let you know all is well. It doesn’t really matter how the turkey gets to the table as long as it does arrive and is extremely tasty! 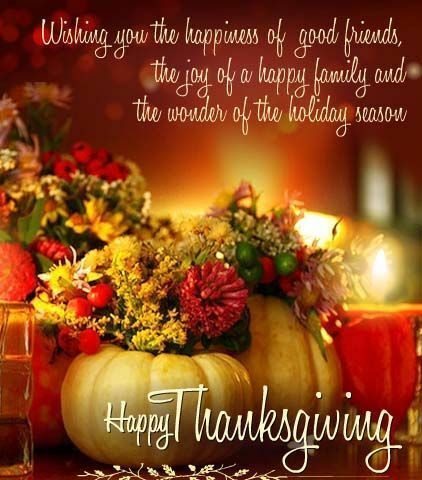 November 22, 2018: Even though there is a lot going on for you right now, it’s a holiday and a time to put aside everything else to be with those you love. Take some chill time.